World Bank President Paul Wolfowitz has said he would not resign in the face of "bogus" charges against him. In a statement to a panel of World Bank directors, the embattled chief said he was the victim of a "smear campaign". Mr Wolfowitz was defending himself against accusations that he pushed through a huge pay package for his girlfriend without the Bank's consent. The committee is due to report to the Bank's board of 24 representatives, who will decide on the president's fate. Mr Wolfowitz has apologised for his actions, vowing to stay on to complete what he called "important work". 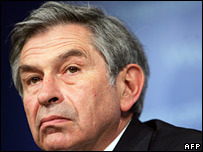 Earlier, US President George W Bush said he believed Mr Wolfowitz "ought to stay" in his job. But a growing army of voices, including World Bank colleagues and the European Parliament, are calling for Mr Wolfowitz' resignation amid escalating concern the scandal embroiling the former Pentagon number two is damaging the credibility of the global lender. International development group Oxfam called his continued presidency "untenable" in an open letter to the Guardian newspaper on Monday. Mr Wolfowitz said the World Bank's ethics committee had access to his decision to relocate his girlfriend, Shaha Riza, to the US State Department in 2005 "if they wanted it". Mr Wolfowitz has previously said that Ms Riza's salary increase to almost $200,000 (£100,000) "was well within the parameters" of the World Bank's salary and benefits structure. "I acted transparently, sought and received guidance from the bank's ethics committee and conducted myself in good faith in accordance with that guidance," Mr Wolfowitz told the panel. "I will not resign in the face of a plainly bogus charge of conflict of interest," he added. "The goal of this smear campaign, I believe, is to create a self-fulfilling prophecy that I am an ineffective leader and must step down for that reason alone." Mr Wolfowitz appeared at Monday's meeting with Washington lawyer Robert Bennett, who is famous for helping former president Bill Clinton settle sexual harassment charges in 1998. "We want to make a presentation to them to show that this conflict-of-interest allegation is absolutely false," Mr Bennett said ahead of meeting. Mr Wolfowitz was a controversial nominee to the post of head of the World Bank because of his support for the war in Iraq.